As of September 16, 2013, OSHA has announced the latest round of Susan Harwood Training Grant recipients. OSHA awarded $10.1 million to the various recipients. There's a few that the Industrious Hygienist is really excited about. "The grantee will deliver training on ergonomic hazards for workers in the commercial fishing and fish processing industry. The goal is to educate workers on the basics of ergonomics including assessing ergonomic hazards in the workplace, redesigning work space for improved ergonomics, prevention of musculoskeletal disorders (MSDs) and exercises for preventing and relieving symptoms associated with MSDs. Training will be offered in English, Spanish and Vietnamese." Why am I excited? The ergonomics recommendations will be focused on the commercial fishing industry, and Alaska Marine Safety Education Association (AMSEA) seems to have excellent outreach to their target population. Their website is informational and well-organized. Plus, I have an Alaskan Malamute, so our household is a fan of many Alaska-related things. "The grantee will develop and deliver training on multiple topics to automotive industry workers. The training will cover hazards to which automotive repair workers, mechanics and technicians can be exposed to in certain jobs including crystalline silica, asbestos, lead, hexavalent chromium and physical hazards that can cause respiratory disease, neurologic problems, skin disorders, allergies, cancer, hearing loss, eye injuries, and ergonomic injuries." Why am I excited? National Jewish Health has been rated the leading respiratory hospital in the nation. Their mantra of "Science Transforming Life" is at the core of their research activities, which encompass aspects of mycobacteria, environmental health, occupational health, and allergens, all things which are near and dear to the Industrious Hygienist's heart. Interesting note: National Jewish Health first opened in 1899 as a tuberculosis sanitorium. "The grantee will offer work place violence training for young workers and small businesses employing youth. Training will include an introduction to hazard identification and control; worker rights and responsibilities; and the identification and mitigation of work place violence in the retail and healthcare settings. Training activities will utilize participatory learning methods including interactive discussion, case studies, and role playing." Why am I excited? The MassCOSH group seems to be extensively collaborative and holds a leadership academy for teen workers to promote job safety. Some of their core initiatives are: "Healthy Schools Initiative," "Immigrant Worker Center," "Teens Lead At Work," and a focus on union education and organization. They have articles, reports, and fact sheets from their educational findings. "The grantee will provide training on safety and ergonomics to small utility employees and contractors. The training will target small businesses, non-English speaking/limited English proficiency, minority and other hard to reach workers. The grantee will also develop training materials for employees in the green/renewable power-generation (solar, wind and biofuel) sector in English and Spanish." Why am I excited? The green/renewable power generation sector needs training and hazard assessments for the work being conducted at the generating sites. "The grantee will present training to workers employed in the home care, nursing home, and hospital sectors of the health care industry. The target audience will include non-English speaking/limited English proficiency, non-literate and low literacy workers, immigrant and minority workers. The grantee will develop and present a Hazard Communication (HazCom) course in English, Spanish, Chinese, and Russian." Why am I excited? Healthcare health and safety is my specialty, and since OSHA announced its National Emphasis Program on Nursing Homes and Personal Care Facilities in April 2012, I've been hoping for someone to develop this kind of training. Thanks to OSHA for offering the Susan Harwood Training Grants. In response to the incredible flooding in Colorado earlier this month, the National Institutes of Health (NIH) via their National Institute of Environmental Health Sciences (NIEHS) published a new web page with information on emergency preparedness and response in flood situations. See the web page here on floods. NIEHS emphasized the preparedness factor for responders to flooding, cleanup workers and restoration workers, homeowners, and business owners. The training/information covers safety awareness and post-disaster hazards. radiological dispersion devices (RDD) a.k.a. "dirty bombs"
The Industrious Hygienist is always excited to find new references to explore and share with others! Thanks to NIEHS for the useful tools and guidance from a variety of federal departments. Dangit, I missed "Happy N95 Day" on September 5th from NIOSH! The Industrious Hygienist likes to stay abreast of interesting things in occupational health and safety. The National Institute for Occupational Safety and Health (NIOSH) celebrated its second anniversary of N95 Day on September 5, 2013. NIOSH spent the day promoting its Epidemiological Global Health Project (Supercourse), which it developed with the University of Pittsburgh. NIOSH also promoted their "Know It's NIOSH" campaign, which is dedicated to helping workers understand how to determine if their respirator is NIOSH-approved. The University of Pittsburgh Supercourse has an presentation about the "Know It's NIOSH" campaign, viewable here. Following my commitment to healthcare occupational health and safety, I quickly downloaded the new (June 2013) "Respirator Awareness: Your Health May Depend On It - Personal Protective Equipment for Healthcare Workers" from NIOSH. In a partnership with California Department of Public Health, NIOSH also developed an online toolkit for respirator program administrators in health care workplaces. Thanks to NIOSH for developing these helpful courses, toolkits, and helpful infographics, like the one shown below. 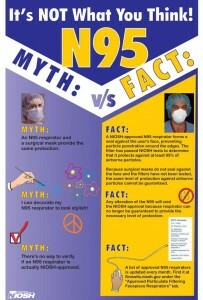 NIOSH N95 Day Infographic (c) NIOSH. NIOSH made sure to link to the awesome OSHA training videos on respirator protection. The Industrious Hygienist looks forward to sharing this exciting new information with health care safety professionals for the next few months. A molasses spill in Hawaii? I hearken back to 1919 in Boston. I was intrigued to see the following news story from Hawaii about the molasses spill that occurred in Honolulu Harbor (or was first noticed, accounts differ) on Monday. According to the article, approximately 224,000 gallons of molasses spilled into the harbor and the United States Environmental Protection Agency is sending two spill experts to help the state characterize the damage and work towards a sustainable solution. This article from Hawaii News Now explains that the responsible party, Matson Navigation Company, released more than a ton of molasses into the harbor. An investigation was done by Hawaii Department of Health when dead fish started showing throughout the harbor on Monday, about "three days after a faulty Matson pipe discharged 233,000 gallons of molasses into the water, resulting in a mass kill." According to Reuters, the release was first noticed on Monday after a ship pulled out to sea, loaded with molasses. On Tuesday, Matson discovered a leak in the pipeline used to fill the ship. The Reuters article contained a statement from the Department of Health that the molasses would likely not harm humans, but it was "polluting the water, causing fish to die and could lead to an increase in predator species such as sharks, barracuda and eels." CNN already beat me to the punch (or some sort of molasses-based beverage) on making the comparison, but this is not the first time molasses has caused such widespread devastation. Courtesy of Wikipedia, in 1919 Boston, a molasses storage tank burst and approximately 2.3 million gallons of molasses were released from the storage area of the Purity Distilling Company into North End Boston. The "wave" of molasses ranged from 8 to 15 feet high and was estimated to had moved up to 35 miles per hour, sweeping buildings off their foundations, damaging railroad girders, and killing 21 people (150 injured). 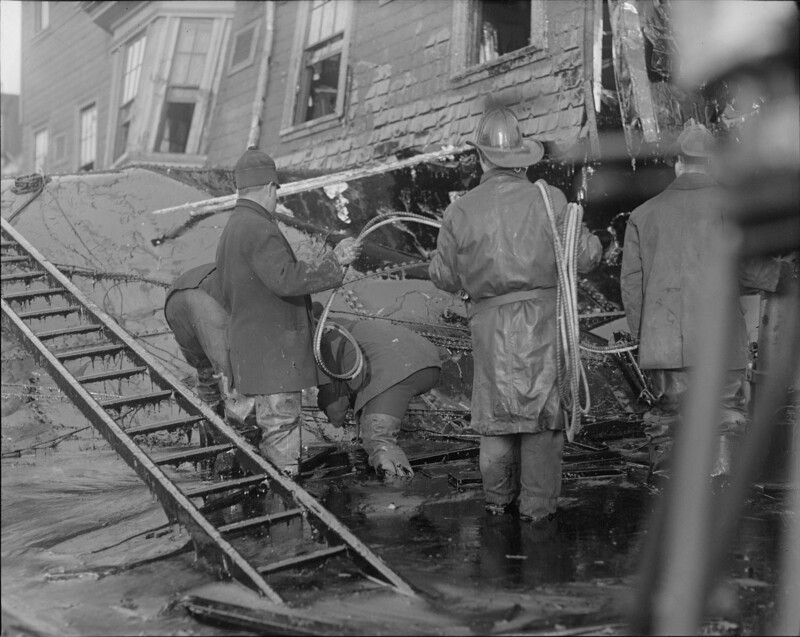 Firemen in Boston's North End standing in sometimes knee-deep molasses. (c) Boston Public Library. The Wikipedia article notes that the "harbor was brown with molasses until summer" (spill happened in January 1919). I couldn't find any information on whether the molasses spill into the Boston harbor also resulted in a large fish and other marine life die-off. Many news companies ran articles with indirect quotes from a senior executive for Matson stating that Matson had not really planned ahead of time for the possibility of a spill. The Honolulu Star Advertiser ran a story that Matson "did not have a response plan for a molasses spill, even though its vessels export as much as 2,000 tons of the viscous liquid each week to the mainland from a pipeline at Hono�lulu Harbor." The response plan they're talking about would likely be similar to a Spill Countermeasures and Control Plan (SPCC). An SPCC Plan requires companies with the potential to release oil discharges (and possibly other toxic substances, I am not an SPCC expert) to prepare an SPCC Plan, amend the plan when conditions change, and of course implement the plan, so that prevention of spills is the primary objective. SPCC Plans also cover preparedness activities and response to spills. SPCC is intended to protect navigable waters and their adjoining shorelines. There's probably a maritime equivalent, but the Industrious Hygienist lives in Arizona, so my knowledge of maritime standards is limited.